This blog is no longer updated as of Patch 4.2. Feel free to take/re-use any pictures and diagrams that are still relevant. Battlefield 3 is out...why the heck are you here? PvE Frost is a competitive spec. Period. For whatever reason, people who aren't strong thinkers or slept through every statitistics class they ever been in(and I can't blame you either) love to post RaidBots pages "proving" that not only is Frost the worst Mage Spec; it's the worst PvE DPS spec in the game among all classes. Well here's the facts; using a minimal/zero movement fight as our example. Normal Mode Baeleroc in the Firelands Instance. Yes, Arcane has a small DPS edge over Frost. 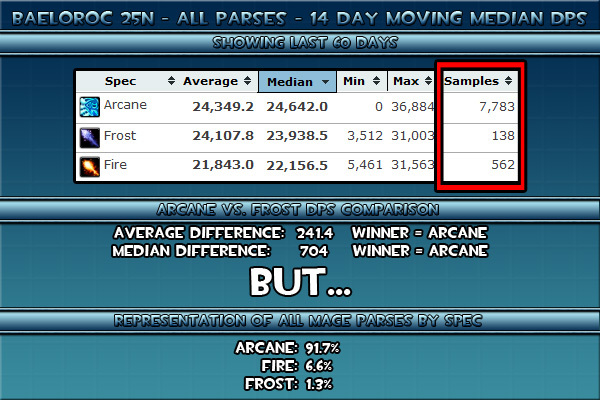 Look again at the representation of total parses by spec...Arcane has a very small DPS edge, with a sample size fifty-six times greater than Frost. Statistically speaking, Arcane has an immensely high chance to show a greater DPS average simply due to sample size alone. Not only do these parses include Arcane Mages with Shard of Woe; it is reasonably safe to assume that the majority of the best geared Mages are specced Arcane due to pressure from raid leaders, the stigma associated with using Frost as a PvE spec, and the resulting ignorance that comes along with it. This is also a spec comparison on a fight tailored for Arcane(i.e nearly zero movement turrent style DPS)! Frost's numbers could potentially be inflated if we assume most of the 138 parses are from intelligent individuals who do/did their math homework and ignore the rest of the playerbase throwing rotten vegetables at them. In summation, Frost is absolutely a viable and competitive spec for PvE. Do not let anyone tell you otherwise. Tips, Tricks, UI Mods, and More!